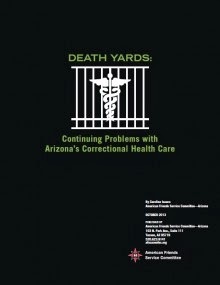 Arizona Prison Watch: DEATH YARDS: Deliberate indifference pays, while prison healthcare deteriorates under Corizon. DEATH YARDS: Deliberate indifference pays, while prison healthcare deteriorates under Corizon. Thanks to the ACLU-AZ et al for their on-going labor of love with Parsons v Ryan. And many thanks to Caroline Isaacs at the AFSC-Tucson for this report, below. PHOENIX, ARIZONA — On Wednesday, November 6th, the American Friends Service Committee (AFSCAZ) and American Civil Liberties Union (ACLUAZ) will hold a press conference in front of the Arizona Department of Corrections Building to coincide with the release of a new report which documents that the same problems—delays and denials of care, lack of timely emergency treatment, failure to provide medication and medical devices, low staffing levels, failure to provide care and protection from infectious disease, denial of specialty care and referrals, and insufficient mental health treatment—have continued and, arguably, worsened under the current for-profit healthcare contractor, Corizon. The American Friends Service Committee (AFSCAZ) and American Civil Liberties Union (ACLUAZ) are decrying the continued deterioration of the quality of medical care in the Arizona Department of Corrections (ADC). In March of 2012, the ACLU filed a class action lawsuit against ADC, charging that prisoners in the custody of the Arizona Department of Corrections receive such grossly inadequate medical, mental health and dental care that they are in grave danger of suffering serious and preventable injury, amputation, disfigurement and even death. AFSC reports that there have been 50 deaths in Arizona Department of Corrections custody in just the first eight months of 2013. That is a dramatic increase from previous years. The Arizona Republic reported 37 deaths in 2011 and 2012 combined. The report charges that the deficiencies in quality of care are not isolated to one or two locations or individual “bad actors,” but clearly represent system-wide dysfunction. The report contains 14 specific case studies to illustrate these issues, as well as extensive documentation of the administrative, organizational, economic and political factors that are contributing to the problem. This includes the process of privatization of medical care. Delays and a reissue of the Request for Proposals (RFP) made the privatization process drag out for over two years. In the meantime, medical staffing levels plummeted and health care spending in prisons dropped by nearly $30 million. The departure of Wexford, followed by the award of the contract to Corizon created additional upheaval, delays, and changes in staff, procedures, and medications. The report concludes that contracting out the medical care at ADC has resulted in more bureaucracy, less communication, and increased healthcare risks for prisoners. For more information, please contact Caroline Isaacs at 520.623.9141 or by email at cisaacs@afsc.org.